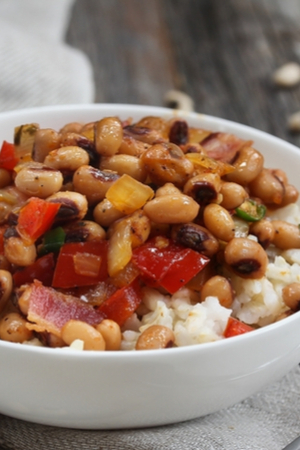 With the new year around the corner, it is time to share our Instant Pot Hoppin’ John recipe. If you have never heard of this dish, you aren’t alone. 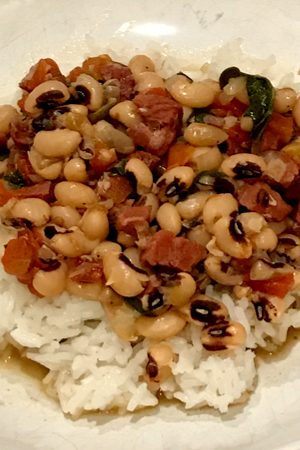 A bowl of Instant Pot Hoppin’ John over a bed of rice. This classic good-luck meal originates in the Southern part of the United States. More specifically, the southeastern states. Because I am originally from the North, I had never heard of eating Hoppin’ John for our good-luck New Year’s Day meal. In fact, it was a tradition in our home to eat pork roast and sauerkraut on the first day of the year. I thought everyone did. I had no idea that there were other meal traditions throughout the United States. 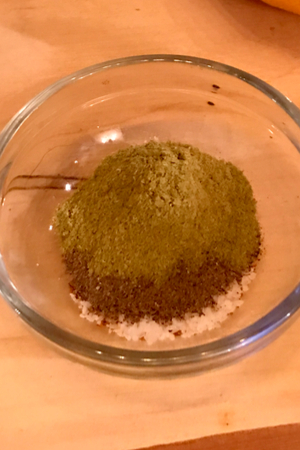 The spices that give Instant Pot Hoppin’ John it’s flavor. However, over the past 5 years I have spent some time visiting and living in the South. And by doing so, I have had the pleasure of experiencing some recipes that I had never tried, or even heard of before. I can honestly say that I had never had black-eyed peas when I was growing up. I wasn’t found of peas in general and when I was offered them as a side dish in a restaurant in Tennessee, I kindly declined. Boy did I feel silly when I found out that they weren’t even peas! Black-eyed Peas are actually beans. And why are they symbol of good luck and a tradition to eat on New Year’s Day. 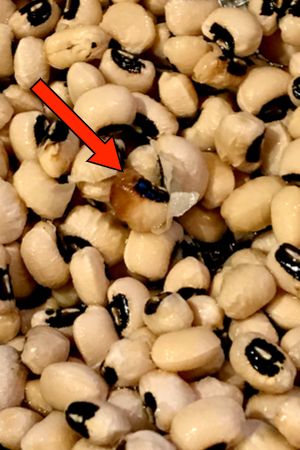 When cooked, black-eyed peas swell up which symbolizes prosperity. Be sure to rinse your black eyed peas and discard any discolored ones. They are often eaten with collard greens. This deep rich green color stands for money. And just like up in the North, eating pork is a good luck tradition. The reasoning behind eating pork is rumored from the fact that when pigs forage, they always do so in a forward motion. Thus, pork symbolizes positive motion forward for the new year. 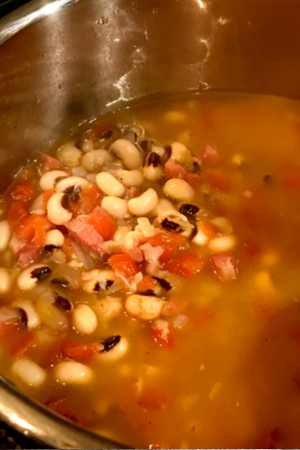 So why make Instant Pot Hoppin’ John? 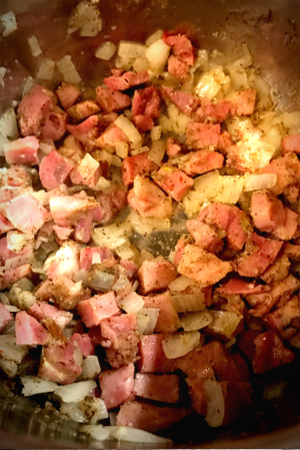 After the onions and garlic saute, add the diced ham and spices. The answer is simple – there is no better way to make beans! The Instant Pot cooks beans in a fraction of the time that it takes other methods. We used our Instant Pot 3 quart mini for this recipe. However, we have also doubled this recipe and made it in our 6 quart and 8 quart Instant Pots. (Yes, we may have an Instant Pot addiction). But the best part of all – there is no need to soak the beans prior to cooking! Just put them in the Instant Pot with the liquid and seasonings and dinner is ready in less than 30 minutes! Although this is considered a must-have meal on January 1st, we have been making it at least once a month for the past several years. After you release the pressure, add in your julienne greens. We will switch up the ingredients with whatever we have on hand. For instance, we have used bacon and leftover pork chops instead of the ham. We have also switched out the blacked-eyed peas with frozen purple hull peas before. And of course we use a variety of greens to compliment the meal. If we want a one pot meal, the greens go in the recipe as stated below. However, there are some people that prefer to have a traditional side dish of greens alongside the main dish. However you choose to make your good luck meal – we hope that this year is the best one yet! 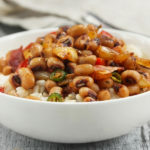 The most popular way to serve Instant Pot Hoppin’ John – over a bed a rice. A southern classic meal that is a must-have on New Year’s Day and that is said to provide good luck when eaten for the upcoming year. 1 can diced tomatoes with green chiles 10 oz. Turn your Instant Pot to sauté and when the display reads HOT, add the butter. As soon as the butter melts, add the diced onion. Sauté for 3 minutes and then add the minced garlic. Continue to sauté for one additional minute. Turn the pot OFF. Add the diced ham, salt, pepper, cayenne, and thyme. Stir. Add the can of diced tomatoes and chiles, the rinsed and drained black eyed peas and chicken broth. Close lid and place steam valve in sealed position. Pressure cook/Manual on HIGH pressure for 15 minutes. Once the cooking time expires perform a controlled quick release and stir. Add the julienned greens to the liquid and replace the lid and Pressure Cook/Manual on High Pressure for an additional 4 minutes. Once time cooking time expires perform a quick release. Serve over rice. This recipe was made in a 3 quart Instant Pot Mini and can easily be doubled to make in the 6 quart or 8 quart Instant Pot. The Instant Pot will require additional time to come to pressure before the cook time begins.